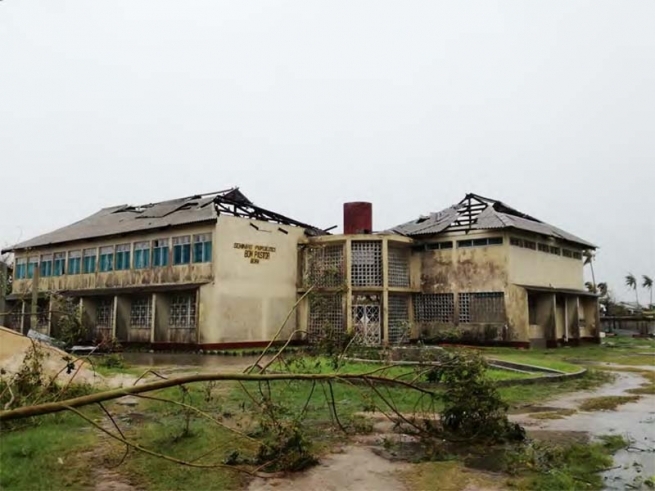 After weeks of torrential rains and floods, a large area between Mozambique, Zimbabwe and Malawi has been hit by Cyclone Idai. Although the official figures are still being updated, the situation on the ground is defined as “terrifying”: over 200 victims already registered, but the estimates speak of more than 1,000. Of the three countries affected by the fury of the cyclone, Mozambique is probably the hardest struck. The communities of the Salesians and the Daughters of Mary Help of Christians in Mozambique, despite not having homes in the tragedy’s epicenter, are mobilizing to assist the victims by providing food, clothing and basic necessities, as well as their prayers. In the coastal city of Beira, 90% of the buildings have been destroyed or damaged, while most of the population is displaced. Also severely damaged are sections of the hospital and the city’s most important access roads. The port is only partially operational, but still allows for the arrival of aid by sea. Other central provinces of Manica, Zambezia and Tete have also been affected by floods, as well as part of the northern part of Niassa. Many of the inland villages have remained isolated and still inaccessible to relief efforts.